Anna Boniface seemed to have the world at her feet when finishing as the 2017 London Marathon's fastest amateur female runner. 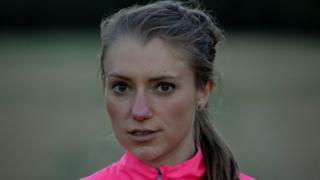 Her performance earned her an England team place in that autumn's Toronto Marathon. The then 25-year-old finished the London race in two hours, 37 minutes and travelled to Canada six months later. But 10 miles into her international debut, Anna's ankle fractured. "It was the breakthrough that broke me," she tells BBC 5 live Investigates. "It was horrible, I'd never not finished a race in my life. I thought I could just struggle to the end somehow, but I realised I would not be able to go on, I just had to sit on the kerb and wait." This occurs when sports people restrict their diet in the belief that constant weight loss will keep improving performance, to such an extent that some of the body's functions begin to shut down. "It was a lot to do with my training volume and not eating enough - not being wide enough in my food groups, being restrictive with carbohydrates," she says. "I was training twice a day, I was running 100-plus miles a week at times, and you burn up a lot of energy with that, and from a runner's perspective you get it into your mind that you need to be this race weight. "You get caught up in this cycle of running really fast, wanting to lose a little more weight, push that race weight a little bit more, running faster, and then just breaking, which is what happened." Lewis Hamilton: Could a vegan diet hamper his 'racing edge'? Serena Williams: How did she compete while pregnant? The state of Anna's health was discovered before any more serious damage could be done and, after a year's rest, she has been able to slowly return to running. Red-S can affect male and female athletes and became a recognised condition in 2014 - replacing another condition called female athlete triad, which recognised the effect of too few calories among sportswomen only. For Sam the equation was simple: "Lighter meant faster which meant I stood more chance of winning." "I was told I had very low visceral fat around my body which is essential fat you need to keep you alive," he says. "I was also told that, as well as having no testosterone, I had the bone density of an 80-year-old in my spine and my hips. It was a very scary point in my life." Dr Nicky Keay, a sport and dance endocrinologist, says Red-S occurs when the athlete's body does not have enough energy to sustain it and begins to shut down. She says: "The body partitions the energy you get from your diet. You need an amount to cover training, then the remaining energy is what you need for day-to-day life. "If you're not getting enough spare energy you go into survival mode. Oestrogen levels drop in women and testosterone for men which is key for bone health. "It's like when your phone's battery drops to a low level, it switches off lots of non-essential apps, this is what the body is doing." 5 live Investigates is on BBC Radio 5 live, 9 December at 11:00 GMT - catch up on BBC Sounds.